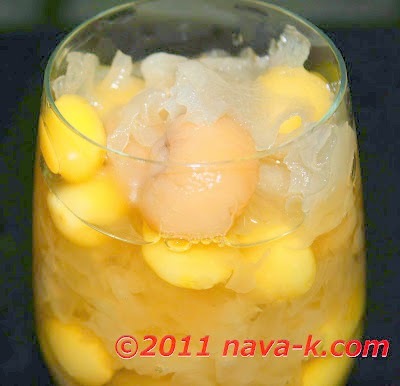 When you feel you want an easy to go to dessert and a dessert which is nutritious, nourishing and soothing to your senses, let me introduce to you White Fungus Gingko Nut. Of course. Without a doubt. A dessert you just need to simmer after getting the ingredients and these ingredients are easily available. In hypermarkets. Otherwise, you wouldn't have wasted your time heading to the nearest Chinese Medical Halls and Chinese Medical Halls, there must one within your vicinity? I sure know so. White Fungus Gingko Nut. What a sweet smooth pleasure. Add water,white fungus and pandan leaves into a pot. Simmer over very low heat for about 1/2 hour. By now, fungus will be soft and nicely doubled up. Put in longan, gingko nuts and rock sugar. Continue to simmer for another 20 mins. This is lovely. You can add gingko and lotus nuts together. Nava, I'm impressed to see a non-Chinese making this dessert. Well done! the white fungus and ginko nuts have a lot of health benefits. great dessert and healthy for you too! Small Kucing & May-Lin - yep, got to agree that this is a healthy dessert and adding snow fungus will also be great. Shirley - being a Malaysian, we have a combination of Indian, Malay, Chinese and many more types of food. Ivynana - thanks for yr comments.